Please note this selection is available via SoundArt only. Clicking the button below will take you to SoundArt’s website. 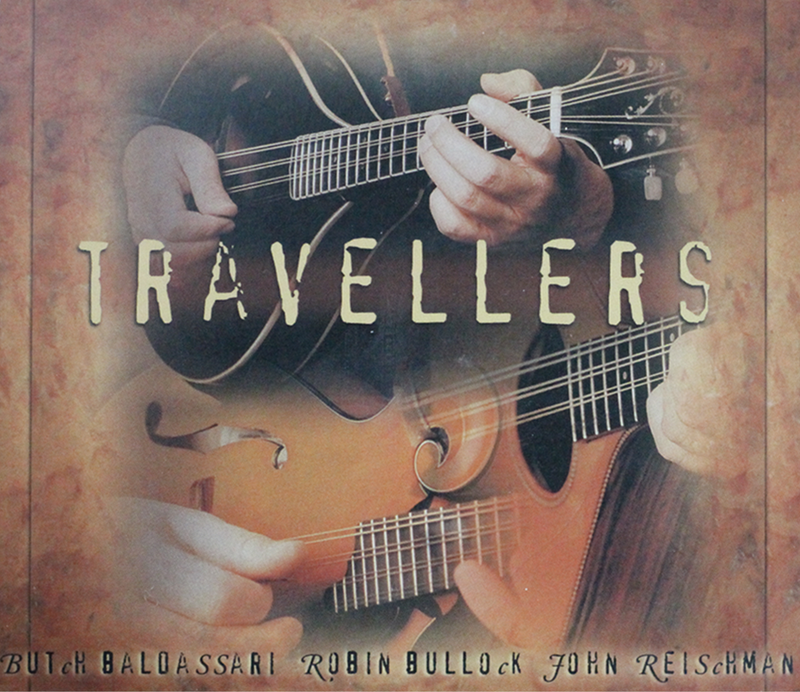 When Butch Baldassari, Robin Bullock and John Reischman brought their unique individual talents together to record Travellers, they didn’t realize they would be creating a new, cross-cultural genre of acoustic music. Each musician solos brilliantly. Baldassari, founder of the Nashville Mandolin Ensemble, reaches into his bluegrass background for an inspired Bill Monroe-style solo on “Dead March.” Reischman demonstrates on the Mexican “Jesusita en Chichuahua” (Jesse Polka) the eclectic virtuosity that has made him a defining force of the “new acoustic” scene. Bullock’s performance on “Rising Fawn Reel,” which he wrote as a tribute to guitarist Norman Blake, shows why he is one of the leading lights of Celtic music. They shine brightest as a collective trio. On Frank Wakefield’s “Waltz in the Bluegrass,” Baldassari and Reischman play twin mandolins, harmonizing and phrasing as if they were one. They answer each other’s phrases on “Old French” like the left and right hands of the same person (in the stereo mix Baldassari is on the left, Reischman on the right). The power of three musicians playing as one is best illustrated on “Little Jacky Wilson,” a seldom-heard Kentucky fiddle tune that Bullock learned from old-time fiddler Pete Sutherland, which becomes a tour de force for mandolin trio. Moreover, in the hands of these three musicians the concept of one-ness extends into their own style of music. They’ve created a common ground shared by the traditional dance styles of all cultures. They capture the elegant beauty of a waltz in the Venezuelan “Como Llora Una Estrella” (“As Weeps a Star”), and they erase the lines delineating American fiddle tunes from Celtic music in the medley of “Arkansas Traveller,” “Little Rabbit” and “Miss McLeod’s Reel,” the last of which originated as a bagpipe tune from the Scottish Highlands. Fiddle tunes come from all eras, yet they sound as if they all emanate from the same source of inspiration. “Kelsterne Garden” and “Childgrove” date back to colonial America of the 1700s. “Dead March” and “Jenny Lynn” come from “Uncle Pen” Vandiver, who taught them to his nephew, bluegrass patriarch Bill Monroe. “Chief Sitting Bull” and “Blue Eagle” are favorites from Texas contest fiddling. “President Garfield’s Hornpipe” and “President Grant’s Hornpipe” were taken straight out of Cole’s Collection of Fiddle Tunes. The group found virtually no stylistic boundaries. A tune written by Irish accordionist Joe Cooley, “The Wise Maid,” sounds perfectly mated with “Swinging on a Gate,” which Bullock learned from hammered dulcimer pioneer Bill Spence. They are just as comfortable with the engaging rhythms of the Mexican tune “El Grillo” (The Cricket). And they stretch out with a swinging Django Reinhardt-style treatment of Reischman’s new-acoustic masterpiece “Birdland Bounce” (originally recorded with Tony Rice as “Birdland Breakdown”). Although the origins may be diverse, a common spirit flows through the music and the musicians. They have traveled to a musical place with no cultural stigmas and preconceptions. They prove that good music is good music, no matter where you find it, and you will find it on Travellers.